Windows 8 To Go Gottcha to watch for! Windows To Go was a new feature introduced in Windows 7, it is really handy way to carry a secure copy of the operating system around with you. You just plug your boot-able thumb drive into a handy computer, reboot it and all your private information a history stays on the thumb drive not on the computer you borrowed. 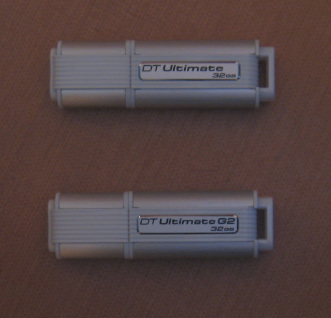 It does take a good sized drive and USB 3 really speeds things up. They look alike don’t they? Well after wasting a few hours trying and trying to redo one of my 32Gb Data Travelers that was booting Window 7 just fine (the top one), I broke down and called Kingston. Apparently windows only allows one partition on removable media and Windows 8 To Go requires 2 partitions. 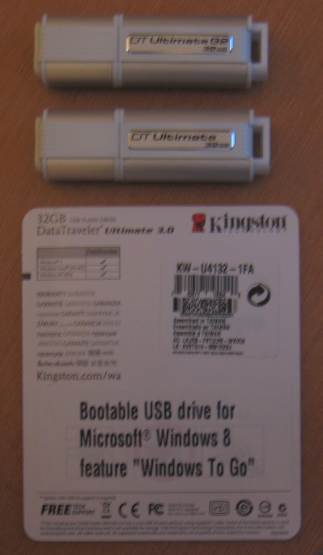 So Kingston had to release a new version of the Data Traveler just for Win 8 (the bottom one), I am reasonably sure the other manufacturers will have to do something similar. So do your homework and make sure the drive you are going to buy specifically says it will support Windows 8 Bootable Windows To Go. The trick to knowing on the Data Traveler is the Model Number will start with KW instead of DT, this number is stamped on the metal part of the USB plug, I tried to get a picture but it was impossible to see. So here is what the card looks like that is in the package of the correct model. If you want to look on the metal tounge of the USB plug I recommend bringing a strong magnifing glass to the store with you. Something else you should know the process to create the Windows to go drive has changed as well.